Welcome to the vCRASH Academy! At vCRASH Academy, we'll keep you informed with the latest information, lessons, and tutorials on Virtual CRASH products. Click on our User's Guide and videos below to get started! New lessons will be uploaded frequently. Be sure to visit the Training Page to learn about opportunities for live Virtual CRASH training. You can find more tips and tricks on the vCRASH Blog. 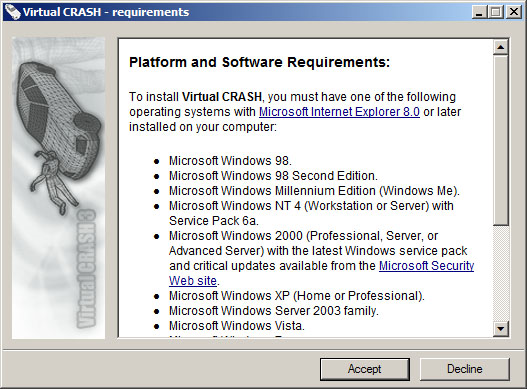 Find out what other Virtual CRASH 3 users are asking and learn the answers. Here you will find the list of unique vehicles and objects mesh shapes in the Virtual CRASH database. Because there are thousands of vehicles defined in the Virtual CRASH software database which use a generic vehicle mesh, vCRASH, Americas, Inc. recommends users first locate a suitable exemplar vehicle from the Vehicles & Objects List pdf file, and then find the corresponding vehicle within Virtual CRASH database in the left side control panel; this will guarantee that your selected vehicle have the desired mesh shape. It is also recommended the user review and adjust vehicle geometrical sizes, cg and wheel positions, as well as inertial properties as appropriate for the subject case. Be sure to check the Gallery in the left-side control panel for North Arrows, Scale Bars, and other useful 2D shapes and 3D models. We're constantly adding new models and shapes for our users! Find the specifications for your vehicle here. Based on the Canadian Vehicle Specifications (CVS) Database.